Better than smoke and mirrors, you can now bring creative fire and water fountains into your landscape design. Water features have long been a popular addition to gardens and lawns. Now you can step up your game by adding fire to the fountain. Think about it. Everyone loves the soothing sound of trickling water and splashing gurgles as a small stream hits the fountain’s pool of water. It’s completely relaxing. And everyone loves staring into the flames of a campfire, that flickering sensation of dancing colors. Now you can have both doubling the mesmerizing effect. 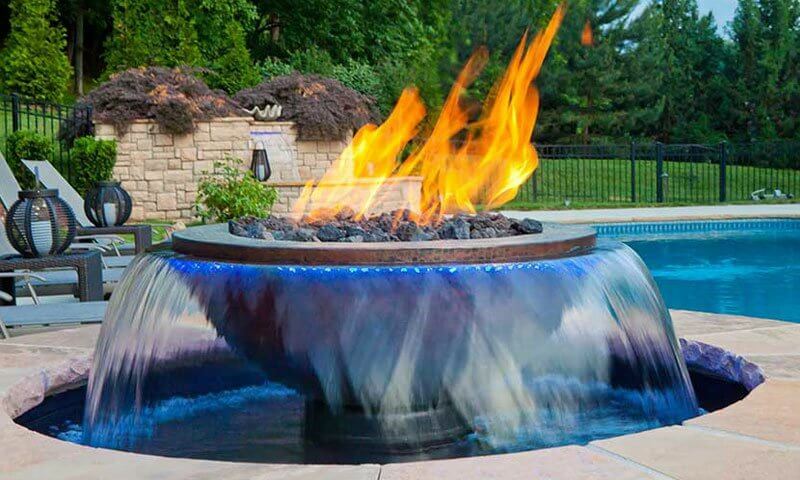 Fire fountains are becoming an increasingly popular craze. With the latest technology now readily available, you can have a razzle-dazzle fire on water show in your own yard. You may wonder how you can have fire mixed with water without the liquid extinguishing it. The product is distinctive in that the flame comes from beneath the water. There are several versions of fire and water kits but most of those only offer the illusion of mixed elements. True fire fountain technology actually combines the two resulting in fire on water. The secret to the “magic” is currently patent pending but it utilizes vaporizer tips which are made of stainless steel and mounted on the manifold. The clever design allows gas to leave the base but prevents water from backing up into the gas line. Just like a gas grill, the fire fountain is fueled by propane. It can be ignited in two different ways: use a grill pit lighter to ignite manually or invest in the automatic remote ignition system. The automatic remote is quite ingenious – you can ignite it in all weather conditions. A mechanism inside the system has been developed to regulate the effects of wind up to a wild speed of 50 MPH. Additionally the design prevents debris from entering the valves which could clog the gas line. Even more intriguing technology allows the remote ignition to be installed as an on/off switch near the unit or connected to a wireless device that can be kept on a key ring. The manifolds for the fire and water fountains are typically sold separately from the actual fountain structure. Most users purchase a fountain that they like and then the manifold and the gas valves are retrofitted. When choosing a fountain take into consideration that you want it to be constructed of a material that is not combustible – think concrete or cast iron. The fire fountain can be purchased in a variety of sizes with the smallest a 7 inch manifold. Most popular sizes run between 12 and 18 inches, but you can also order custom sized products. If you have worked hard to create a beautiful landscape then you probably want to spend lots of time hanging out in your yard enjoying the results of your efforts. A fire and water fountain is a beautiful feature that can be a wonderful addition to your home front. It will provide you many special moments whether you are relaxing with family or entertaining friends. Though the combination of fire and water can appear formidable, these fountains are as safe to have on your property as a gas grill. They are also pretty affordable for such a durable product. It you want to add a fascinating feature to your property be sure to check out fire and water fountains. If you have questions about installation, a local landscape professional should be able to help you install the perfect one for your setting.